Can You Thicken Soup With Xanthan Gum? 1 Do You Use Flour or Corn Starch to Thicken Soup? 4 What Can I Substitute for Cornstarch? Xanthan gum, first discovered in the 1950s by USDA scientist Allene Jeanes, is a natural substance produced by the bacteria Xanthomonas campestris. It is an ingredient in many commercial sauces, salad dressings and ice cream, and is a staple in the pantry of those who cannot tolerate gluten. This excellent thickening agent is widely available in health food stores, and you can use it to thicken soup without worrying about changing the soup's flavor. 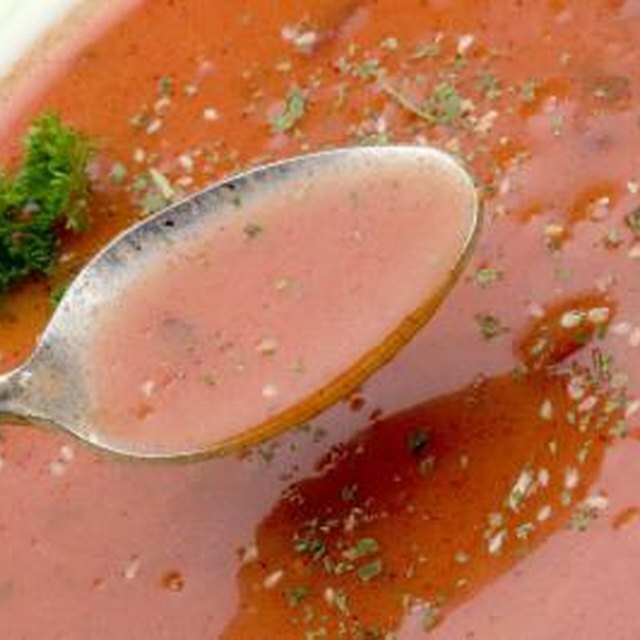 Some thickeners will not dissolve in cold soups, while others begin to get too thick as soon as you remove them from a source of heat, resulting in a soup that can seem more like a gravy. One property that makes xantham gum an excellent soup thickener is its ability to thicken regardless of temperature. You can use it in gazpacho or chicken noodle soup, and it will retain its viscosity. Xanthan gum is an extremely effective thickener -- you just need a little, and it doesn’t affect the taste of your soup. Most recipes call for only 1 teaspoon in place of each tablespoon of flour or cornstarch. Put another way, you’ll need about 1/8 teaspoon for 1 cup of liquid. For such a small amount, digital scales are more accurate than volume measurements. Flour and cornstarch typically require much higher proportions to achieve the same thickness. Delicately-flavored asparagus soup can be overwhelmed by the addition of flour, but you won't taste the small amount of xanthan gum. Often added to commercial ice cream to improve the texture and give it a creamy smoothness, xanthan gum will do the same for your soup. If you're cutting back on calories, you can use xanthan gum to replace at least some of the cream in cream-based soups. When adding xanthan gum to soup, it helps to mix it with a little warm liquid first. Dissolve the appropriate amount into a little bit of soup, whisk until it's well blended, then add it back to the soup pot. If you add dry xanthan gum directly to the soup, you might get clumps. Continue stirring until it's completely incorporated. TheKitchn: What's the Deal with Xanthan Gum? Carla's Gluten-Free Recipe Box: What is Xanthan Gum?